This is a blend of spices you can use in place of packaged taco seasoning–and it tastes so much better! I make this mix then put it in a small glass jar so I have it on hand when I need to spice up Mexican dishes or other things like omelettes and popcorn. NOTE: this is enough to mix up and store. You’ll only need 1 tbsp of it for this recipe. Preheat the oven to 350 degrees (325 convection). Bring large pot of water to boil and cook pasta according to package directions. I like to ever so slightly just undercook it as it will cook a little bit more in the oven later. Don’t undercook too much though or you’ll end up with crunchy pasta. The main idea is not overcook it so it’s mushy. Drain and rinse with cold water and set aside to drain and dry out a little. Meanwhile, in a wide shallow 4-5 quart dutch oven or large skillet over medium heat, splash enough olive oil to coat the bottom of the pan and saute leeks and a pinch of kosher salt for about 8-10 minutes or until tender. Add green onions and garlic and saute for another 2 minutes. Reduce heat to low and add in the Vogue Vegetarian Mexican spice mix and saute about a minute or until spices are fragrant. 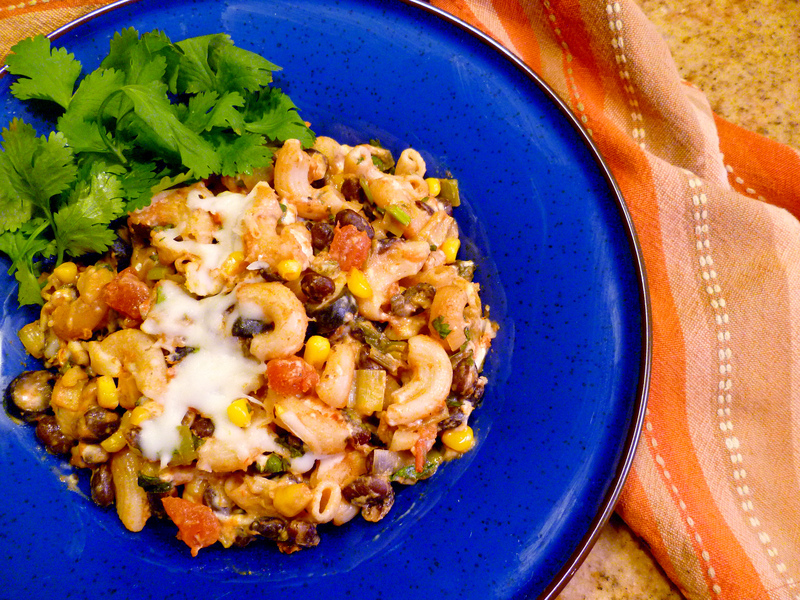 Add the beans, corn, olives and cilantro and cook just another minute then add the salsa. Stir to combine and let heat up for about 2 minutes. Turn off the heat and add in the Daiya cheese and stir well. Taste for spice and flavor. Add in the pasta and stir well to combine. Taste the mixture for spice level and salt and add as needed. 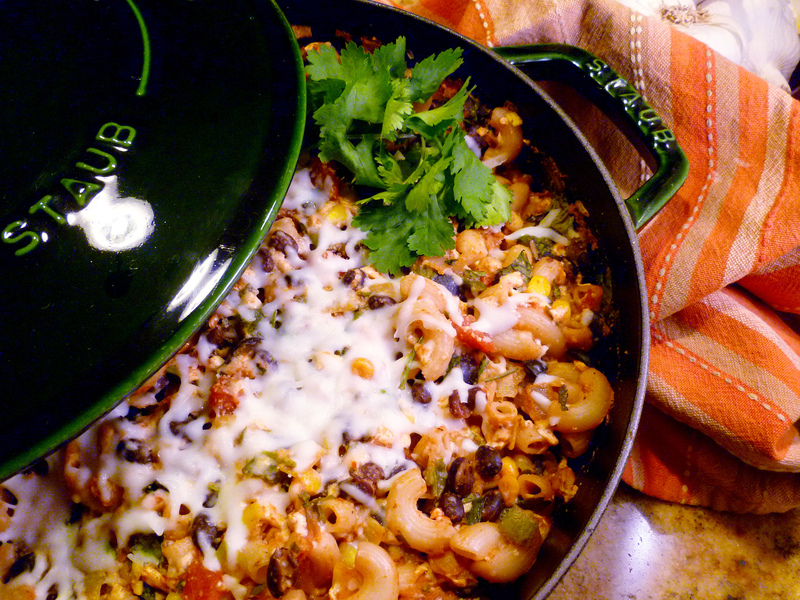 Cover your dutch oven with the lid or empty the pan into a covered casserole dish. I like to put a little Daiya or Rice Shreds Mozzerella over the top, too. Place in the oven for 30-35 minutes or until warmed through and cheese is melted. You can take the lid off for the last few minutes to get a little extra melting action if desired. Footnotes: If you are not vegan, you can make this dish with any cheese you favor. Cheddar and pepperjack work well. I like to use whole grain pasta. 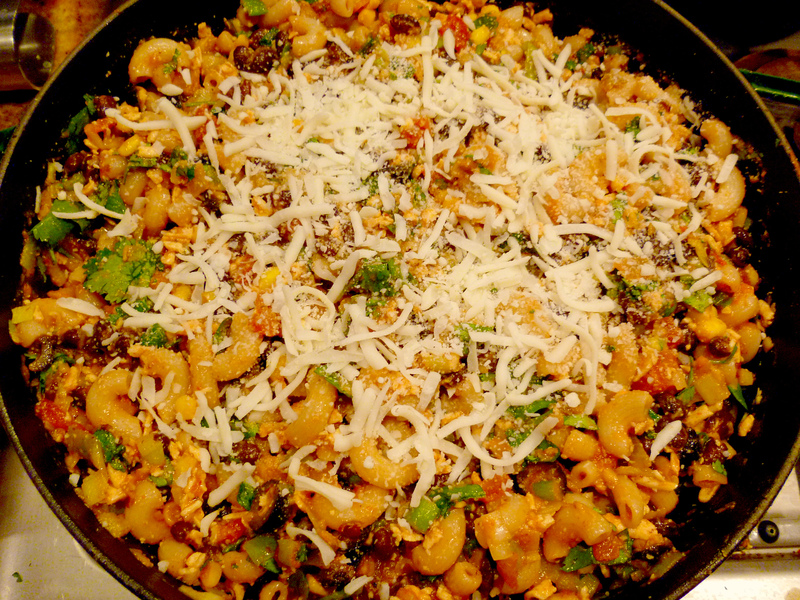 Wheat is a good pasta to use here because it stays pretty chewy even after baked. I like brown rice pasta myself and it’s gluten free, too. If you use another pasta, just make sure NOT to overcook it and use a large substantial size such as rotini, penne or elbow. 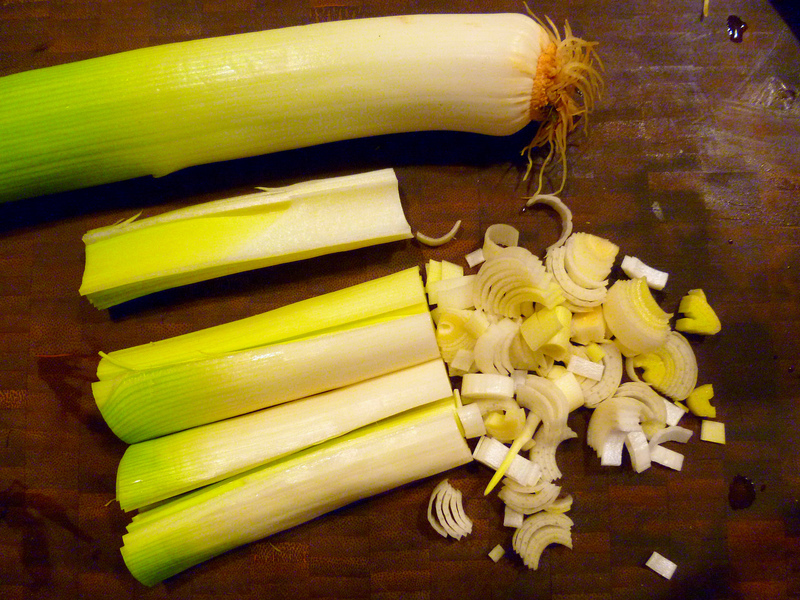 Chop leeks in quarter lengthwise then in about 1/2 inch slices. Don’t forget to clean your leeks first! 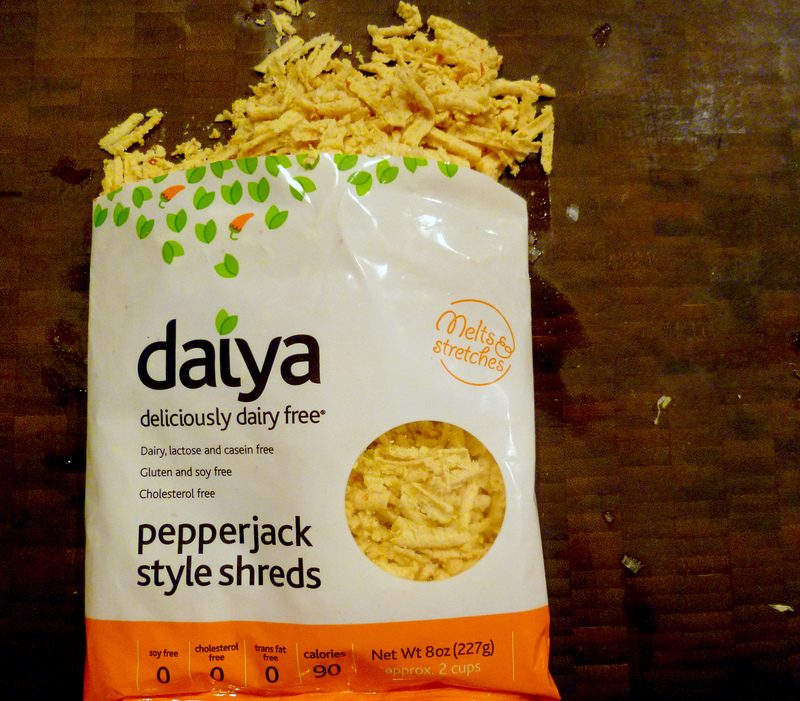 If you use Daiya brand, I like the pepperjack flavor the best. Mozzerella tastes a little strong to me. This is the same pan that I sauteed all the ingredients in. If you have a shallow dutch oven/braiser or an oven proof skillet, it’s great to be able to use one pan for the whole dish. This pot also goes right into the refrigerator when I am all done so we can eat leftovers out of it the next day. Here is a shot of all the ingredients added to the pan, sprinkled with a little Mozzerela by Rice Threads and then covered and placed in the oven. Hot out of the oven. Sprinkle with some cilantro and dollop a little vegan sour cream if you like. This looks really good! I think I just need to grab some leeks and I’m ready to try this recipe. Thanks! It passed the test for all my boys in the house and their friends. You might want to add a tsp of chili powder too. It tastes super cheesy. 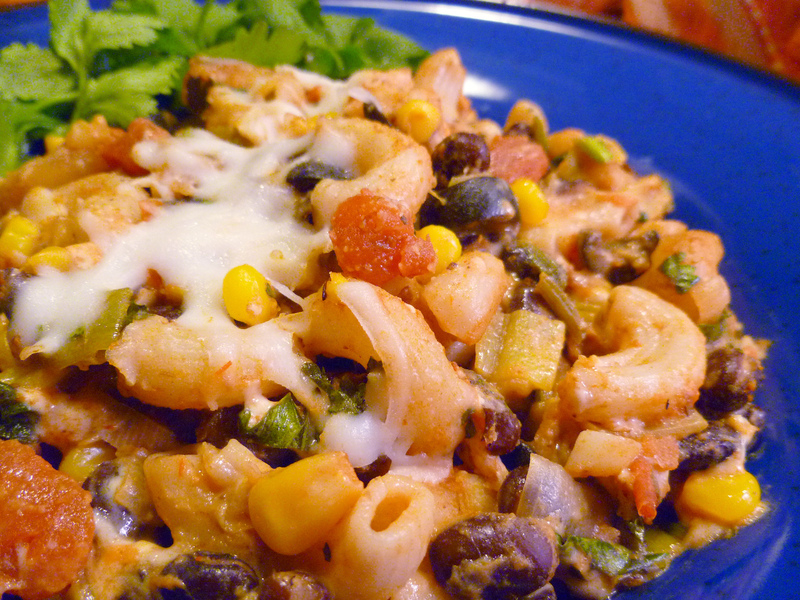 One person said it’s like Mexican mac n’ cheese… I didn’t tell them is wasn’t “real” cheese. Great! I think this may pass with my daughter too. I think the chili powder would be a great edition and I know I’ll add jalapenos too! Yum! This is perfect for Cinco de Mayo. This looks delicious, it reminds me of a dish my mom used to make (except that it wasn’t vegan..) but this is even better! Haha, that’s awesome! This does look really tasty, I might give this a shot and I’m not even Vegan. This sounds like a friday night special to me! Shame it’s only Thursday, I might have to pretend, It’s making me hungry!! A delightful & vegan casserole! Yummy Yum! Looks amazing & mighty tasty too!